Many designers from Kerala follow the path of ‘sustainable fashion’, a global trend that intends to lessen the damage caused to nature. Fashion is a broad term. What comes under it cannot be limited to a single industry or its final product, say clothing. At a time when appearances matter, the idea of presenting yourself as ‘trendy’ and ‘stylish’ is a larger holistic concern. Fashion, in short, is no more a basic necessity. But behind the velvety chic lies a startling fact: Fashion industry is the second largest polluting industry in the world. Every environment day, there is big talk about sustainable practices that can lessen environmental damage. On this environment day, DC tries to map a growing global philosophy known as sustainable fashion and efforts made by some vibrant entrepreneurs and individuals to lessen in their own humble way the industry’s impact on ecology. Ramesh Menon, a prominent fashion consultant, is promoting a sustainable ecosystem for textile production. His objective is fundamentally to reduce the strain on natural resources, caused by increasing textile production. “There are multiple ways to look at sustainability,” Mr Menon said. “Preservation of indigenous crafts, employment factor, an ethical approach to garment manufacture, stress on organic dyes… the entire production chain should have sustainable value,” he said. Sadly, the country lacks an organized system, a green benchmark, to certify the sustainability factor. Mr Menon rues the contrived sartorial tastes of the Malayali. “If you look at Kerala textiles, it is only popular outside our state. For us, it is more of an occasional wear. In terms of fabric, cotton is the most suitable for our weather, but we have discarded it and gone after synthetic fibres like nylon. The synthetic fibres normally take 80 years to decompose,” Mr Menon said. This obsession with synthetic materials is also a reflection of the state’s growing brand consciousness. “When it comes to handloom, they don’t find it worthy enough to wear it,” he said. Fashion is also a commodity with anorexic shelf life; fashion statements are struck off the blackboard of clothing business, and feverishly rephrased, by big brands as if they were impatient kids having a good time with the chalks their teachers have left behind. This is where recycling and the new concept of sustainable fashion, upcycling, come into play. Upcycling takes recycling to a higher orbit; it converts a used fabric into something completely new. “There are many prominent brands, such as H&M, that take back used clothes to upcycle it to something different,” Mr Menon said. 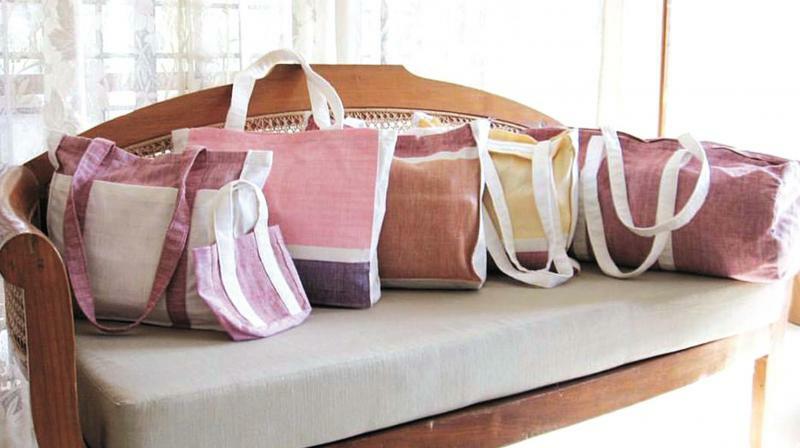 Indu Menon, founder of Kara Weaves, has taken the route of sustainable fashion when she joined hands with a local weaving cooperative to design contemporary home textiles. “We use the Eerezha Thorthu fabric produced by local weavers to make napkins, towels, table clothes, bath robes, table runners and the like. We are producing zero-waste multi-utility products. Since it’s pure cotton, the use of water is highly limited and doesn’t consume much of storage space. Eco-friendly dyes such as Vat dyes, time-tested Azo-free ones, are used,” explains Indu. Another wildly inventive entrepreneur is Sarath V .D., who upcycles used jeans into a variety of products, under the banner Moda. It takes 1,800 gallons of water to make one pair of jeans, and the volume of water that is required to wash a ‘jeans piece’ during its entire life cycle is infinitely more; not to speak of the number of branded jeans one likes to own. “We take old jeans clothes and convert them into pouches, bags and other utilities,” Mr Sarath said. “We scale it up to market standards by weaving in some design elements such as artworks and paintings. We had so many takers for these products,” Mr Sarath said. Creative restlessness can transform even seemingly dull objects into something magically different. Vidya Gopalakrishnan, fashion designer and curator at Grameen, employs her fine skills on her used products instead of dumping them into the waste bin. She makes earrings out of deodorant bottle caps, pouches out of left over fabric, lamp shades from old aluminium bowl. She has even upcycled a men’s shirt to a women’s one with a tiny rip on it. “What I did was to re-use non-perishable materials instead of increasing wastage,” Ms Gopalakrishnan said. She also makes it a point to collect leftovers from textile shops lest they burn them in a heap and contribute to more pollution.